Codeforces Round #521 (Div. 3) will start at Nov/16/2018 17:35 (Moscow time). You will be offered 6 or 7 problems with expected difficulties to compose an interesting competition for participants with ratings up to 1600. Probably, participants from the first division will not be at all interested by this problems. And for 1600-1899 the problems will be too easy. However, all of you who wish to take part and have rating 1600 or higher, can register for the round unofficially. 1359 successful hacks and 755 unsuccessful hacks were made in total! What happen for Div. 3 contests if we haven't Vovuh ? earlier i used to think that i could solve 4-5 problems in div 3 rounds as it would be easy with div3 tag , but now i knew one thing "dhoka hai ye , ek trah ka jaal, shajis hai hamein nicha dikhane ki, haha div3 tag XXXDDDD", don't take it offensively it's just a joke, i love codeforces. 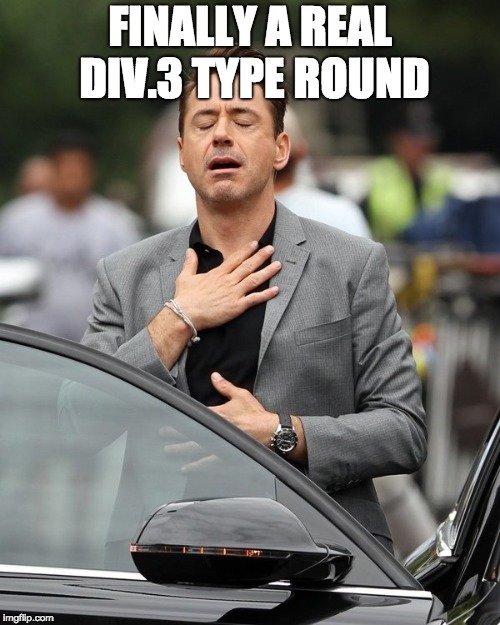 Pardon me this is my first rated(hopefully) Div 3 contest. Why is this rule there? They will be considered in leaderboard table though? If they solve problems fairly then yes, they're will be shown in the leaderboard. This rule is there just to exclude the people who want to be top-5 by unfair hacks. what's the benefit of hacking someone's submission ? does it increases rating or points? I just want to lose Rating, no harm. How to get reminder for this type of contest? Good luck， I hope u can achieve it. it was my purpose. I feel like I could turn blue. Can someone please tell me why my submission for F is getting TLE on test 41 ? Used deque and dp. Basic division and function check on this monotonic function gives you AC. Didn't code this because my implementation skills are bad. But pretty sure this approach is correct. I solve E with lower_bound in c++.I think it's the same as binary search. is your solution have two logs ? Is it works by using binary search(or lower_bound) in every possible numbers of competitions? What is the solution for problem C ? Start from left of the array and if there is a zero in between two ones, remove the right one. Let this be ansA, do the same for the reverse array and let the answer of that be ansB. Final answer is min(ansA, ansB). if you are removing first element of this vector, your remaining sum is S — v.value. remainingSum — v.value should equal to v.value. else your remaining sum is S — v[i].value. remainingSum — v.value should equal to v.value. Can you please Illustrate more ? essentially there are a couple ways to create a good array, both can occur though. type1: removing the largest value, hence the second largest value will have to be the sum of the remaining digits, excluding the originally biggest number (and the second largest of course). type2: removing a value (that is not the largest), to make the sum of all the other values equal to the largest. you can check for both types, which is what i did. For B, I think ansA will always be equal to ansB, so there's no point in calculating both of them. If I'm wrong, can someone please suggest a test case where ansA ≠ ansB? Observation: We are checking if removing an element from the array can make the max element equal to the sum of other remaining elements. And in case we are removing the max element, we are just checking if we can make the second max element equal to the sum of other remaining elements. (Since there is no element with -ve value) So, we just have to find out the max and semi-max element and then iterate the array removing each element at a time and checking the above criteria. for example, a= [5,2,1,3] Max= 5, Semi Max= 3 Removing 5(Max), a=[_,2,1,3] makes Semi Max, 3= 2+1 Removing 1, a=[5,2,_,3] makes Max, 5= 2+3 These two are only bad indices in this example. How to solve the hard version of problem F ? Naive transitions work in O(n) for a total of O(n^3). If we use sliding window for each layer, we can transition each layer in O(n), for a total of O(n^2). Did anyone manage to AC E with dp in O(nlog(109)log(n)), something like this? It's easy to find an array that can by cut out x times. So just do a binary search for the biggest valid x. Where is the tutorial for this contest? Is it intended in F2 that using segtree gives TLE but other data structure like sparse table gives AC? AC with segment tree (1731ms). I think O(n^2) solution with a queue which supports amortized O(1) maximum extraction was intended. Why on problem F the condition if((k*2-1)*x<n) cout<<-1; isn't enough to detect if it's impossible to solve? Do you get points for Hacking other's solution in this round? C Wrong answer on test 3, but I got right answer local.... Why? Plz someone explain me, why 45840553 is TL 16 and 45840575 is RE 1 ? Your cmp function does not define a "strict weak ordering", which std::sort requires. The short version of the explanation is that your predicate should behave like < and not like <=. Failing to meet this requirement causes undefined behavior, which basically means that the verdict may vary arbitrarily. P.S: there might be other problems with the source, this is just one I have noticed. What is the hack for C? A lot of C's solutions are getting hacked. It seems that I was the only one who misunderstood the statement for problem B. Can anyone tell what is it really asking for ?? The question asks for the minimum lights you have to turn off for all peoples "sleep well". If only I had known that before. I thought they were asking how many different pairs of lights I needed to turn off (turning off a single pair), in order for no people to be disturbed. All it required was to search for "101" and keep skipping by 2 so as to prevent any extra count of 101 due to overlap. Here is my submission. What's the benefit of hacking someone's submission in Div 3? Does it helps in increasing rating? No, it doesn't help to increase the rating. I tried to hack a solution (It makes 10^12 operations worst case) but I got unsuccessful hacking however the code I tried to hack takes 128s on my machine itself (with T = 100 , it is 1000 in the test case). I want to ask if hacks are only successful if the code gives WA ? EDIT : here is the link https://codeforces.com/contest/1077/submission/45824799, he is looping from 1 to k/2 when a != b.
WoW ! Looks like CF is real fassst. Can you give the link of solution? Then you have a different version of the compiler. On my machine with GCC 7.2.0 it runs almost instantly. EDIT: Actually, you need to have -O2 as a tag for the compiler to make the solution fast, compiler version doesn't matter. Did it run instantly on a case where k ~ 10^9 and T ~ 100/10 and a!= b? Yes. Did you add -O2 as a compiler tag? Yes , I added that tag and it took about 10s(for t = 100). Though I still dont get that how can it not give TLE since he loops from 1 to k/2 (1e9/2) for every case with a != b.is CF insanely fast or something since I dont see this passing anywhere. See my reply, and learn compiler theory. -O2(at least on my machine) notices that the program increases a number "sum" by a-b l times, so it replaces that part of the code with increasing "sum" by (a-b)*l.
:O nevermind. Thanks for your help. Compiler optimizations. P.S. This is what happens when a person jumps right into the programming, bypassing the CS. Can any one tell me why my solution for E is getting TLE on TestCase 51 I think its Nlog(n). http://codeforces.com/contest/1077/submission/45845419[Link to submission]. In problem E: why is this approach is wrong? please tell me that why this 45850644 passed and this 45850660 failed ..they are almost please help!! What's wrong with std::list? I used sliding window algorithm for F2 and I used std::list to implement it but I got MLE. So I tried to cut down memory by making D instead of D and I got accepted. But when I changed std::list to std::deque, it was accepted and even faster! In another OJ sites I usually use, std::list is faster than std::deque so I thought it would be same here. Can anybody tell me why? MLE code : 45823888 AC code : 45852635 Here is my code. I think so. According to my short experiment using both std::list and std::deque, std::list is faster than std::deque but drains tons of memory. std::deque, on the other hand, uses less memory but slightly slower. There might be something wrong, so if somebody finds anything new, please let me know. Well... std::list is a doubly-linked list, so for every element in it of type T is uses two pointers and one field of type T.
std::deque on the other hand is basically a linked list of increasingly large vectors and uses (more or less) the same space as a vector. As a very rough approximation, if T has the same size as a pointer, std::list will use more or less 3 times more memory than std::deque. Nothing wrong with it, it's just the way the structures are implemented. P.S: Bjarne Stroustrup (the creator of C++) has a very interesting talk on why you should avoid using linked lists. They have their uses (mostly when deletion in the middle is involved), but you should avoid them whenever you can use pretty much anything else. Is it true that SysTest of Educational/div3 round goes this long or is it only this contest? I just realised it today. I did 42 successful hacks but didn't get increase in my rank....how it'll be beneficiary for me? When would the rating changes reflect? I was solving the 3rd problem of round 521 div 3. Problem Link: Problem C I don't know why I'm getting wrong for test case 86. But getting right on my local machine here is the code link Solution. Magic has been hided after the dots, last number of the input is 532704. But still getting right on my machine. Then it isnt that testcase, but you're wrong because m is mapping from int, m[temp/2] will be truncated to m[int(temp/2)]. Thankyou The map is taking some random key with 0 value. Just handled and got ac. For his code the error is int overflow only, just change m's type to <ll,int> and that will AC. the constrain allow to 10^6 why change this give AC? individual element is is under 10^6 but theirs sum may be not. this 45822434 gives me correct answer for question D in my IDE but this is wrong answer. can any body say why? Huge difference between cf-predictor & actual rating change!! What's wrong today? if you "hack" someone by sending inputs that are meant to fail the code you get 100 points if that attempt was successful, likewise the person that was "hacked" will loose their points for the question, as their attempt will be considered a failure. I got hacked and dropped a rank because of it i feel. MikeMirzayanov in predictor, my increment was +98 but i was increased by +77 in change rate why ?? In this round CF predictor shows my rating would be +103 but actual rating increased by +73 :( :( can anyone please tell me the reason why it happens ??? Because when all the values of array are 1e6, value of s will 2*1e5*1e6 which exceeds int datatype. so when you are performing the check at if(mp[(s-a[i])/2]>0) , s — a[i] has already exceeded int's limit. That is why it wraps up again to lower values and gives incorrect result. It is not taking random key. It is wrapping up to the lower values again when exceeds it's limit. same with my solution 45813690 why this fail, and when change map to ll get AC? http://codeforces.com/contest/1077/submission/45868135 Accepted used multiset.lower_bound instead of lower_bound can anyone help why lower_bound is slower in the documentation both function complexity is O(log). No, you are wrong. For non-random access iterators lower_bound is O(N) in complexity so lower_bound on set/multiset will be O(N) while set/multiset::lower_bound would be O(log N). Why i am getting wrong answer for the problem C foe the test case 86 , its output should be 0 but it is showing something else in my case, but i have seen other codes and their submissions, for them the output for the test case 86 is 0. Where can I find the editorial/tutorial for this contest? Can somebody explain O(n^2) solution for F? I've seen solutions with sliding windows using deque but I don't quite understand logic behind it. I don't see the tutorial.Can you give me ? My solution to D without binary search passed — https://codeforces.com/contest/1077/submission/45884322 Are the hacks not included in the final test cases when the problem goes into practice section? UPD: Woops, this solution got TLE now. Weird :p Does this mean that this solution would have gotten Accepted in the main contest? Server time: Apr/26/2019 17:44:06 (e3).